If you’re newly focused on eating a healthy, balanced diet, you might be wondering: Is pizza healthy? The answer depends mainly on the toppings you choose. The four main types of mozzarella used to make pizza are mozzarella di bufala, fior di latte, burrata, and “pizza cheese,” which is used by the majority of American pizzerias. The nutritional value of some of your favorite foods—like french fries, soda, and chips, for example—puts them into the category of junk foods to avoid. They’re filled with too much fat, salt, and/or sugar to be part of a healthy diet. Other foods, however, can straddle the line. If your favorite junk food happens to be round, hot, and cheesy, you might be wondering an obvious question: Is pizza healthy? Let’s break things down a bit. The average slice of cheese pizza, according to the U.S. Department of Agriculture, contains 266 calories, 9 grams of fat, 11 grams of protein, and 2 grams of fiber. 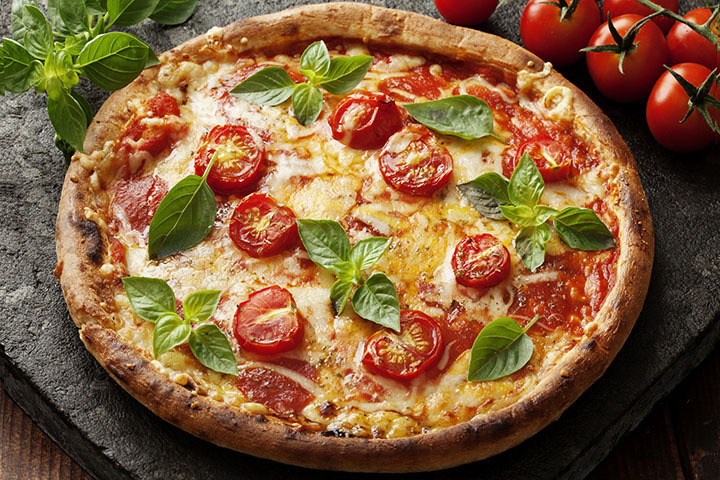 Pizza’s basic ingredients include mozzarella cheese, which is a good source of protein and calcium; tomato sauce, which is a good source of vitamins A and C as well as lycopene; and white flour, which besides being easy to digest, doesn’t have many benefits at all. With the cheese being high in saturated fat and the white flour crust having very little fiber and nutrients, what’s a pizza lover to do? Is Pizza Healthy If I Make It At Home? The answer to the “Is pizza healthy?” question depends on numerous factors. Is your pizza topped with whole milk cheese and/or fatty meats? Was your pizza baked in a deep-dish pan ladled with grease or does it have a very thick crust? Make your own healthy pizza at home. Being able to control what goes into your pizza will help you cut down on unnecessary salt, fat and sugar, and you can avoid any chemicals and preservatives that are normally present in commercially prepared pizzas. Load up on veggies. Pizza is the perfect vehicle for your favorite vegetables as well as some ones you haven’t tried before, because they’re both delicious and nutritious. Peppers, onions, mushrooms, and olives are all healthy pizza topping ideas, but don’t be afraid to experiment. Give squash, broccoli, artichokes, kale, peas, and asparagus a try. Roasting them first in little olive oil, salt, and pepper will add even more flavor. Go easy on the cheese—or skip it altogether. There are almost no rules these days when it comes to pizza, so who says you can’t skip the cheese? It reduces the amount of fat and calories, and makes it vegan-friendly. But if you can’t bear to part with the cheese, try the low-fat version of your favorite cheese or cut in half the amount of full-fat cheese you usually use to make a low-fat pizza. Try using a whole-wheat crust. Swapping out the white flour dough for whole wheat will provide more fiber to aid in digestion, help your body absorb nutrients, and help you stay fuller longer. And if you need to grease your pizza pan before baking, try using just a light touch of olive oil or a canola oil cooking spray. If you’re on a low-carb diet, you can even try skipping the bread and building your pizza on zucchini “boats” or a cauliflower crust. Choose a thinner crust. Less dough means fewer carbs and calories, as well as a crispier crust. Pump up the protein, but dial down the fat. Adding meat to your pizza is a good way to increase its protein content, but swap out traditional processed toppings, like pepperoni and sausage, for leaner proteins such as grilled chicken, ground turkey or a small amount of lean steak. Is Pizza Healthy If It Comes from My Freezer? If you’re looking for a quick and convenient meal, frozen pizza can be a good choice, but it also can be laden with salt, fat, and preservatives that can sabotage your diet. Luckily, there are some brands that are better for you. 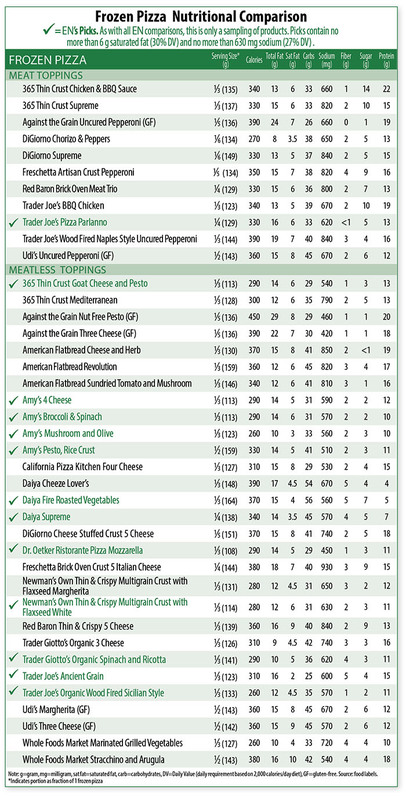 Trader Joe’s Pizza Parlanno is the top pick of frozen pizzas with meat, according to the October 2016 issue of Environmental Nutrition. One serving has 330 calories, 16 grams of fat, and 33 grams of carbs. In the meatless category, EN had 12 top picks—one of which was Amy’s 4 Cheese, which has 290 calories, 14 grams of fat, and 31 grams of carbs. Check out the chart below for the rest of EN’s frozen pizza picks and for additional nutritional information. If you choose a frozen pizza for your meal, consider adding a side salad to boost your fiber and vitamin intake. Also, be sure to stick to the suggested serving size so that you don’t mistakenly double the number of calories and amounts of fat and salt. 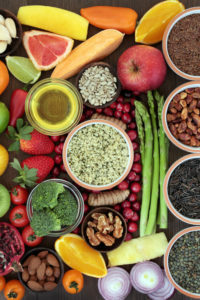 add, calcium, calories, cauliflower, cooking, diet, digestion, fiber, food, foods to avoid, healthy diet, is pizza healthy, kale, low carb diet, lycopene, milk, nutrients, nutrition, nutritional information, nutritional value, preservatives, protein, serving size, sugar, vegetables, vitamin, vitamins, whole wheat. I thought you might be interested in this article on https://universityhealthnews.com: Is Pizza Healthy?